The latest APPSC Extension Officer Syllabus 2019 is provided in the current page. 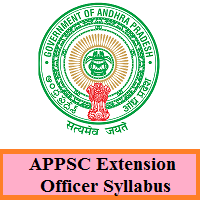 The officials of the Andhra Pradesh Public Service Commission (APPSC) is going to conduct the Prelims and Mains to the applied candidates for the available 109 Extension Officer Grade I (Supervisor) post. So, you all need to attend the examination and for that, you must know the AP PSC EO Test Pattern 2019 with the subject wise psc.ap.gov.in Selection Process 2019 from the below sections of this page. Moreover, you can get the details of the exam pattern with the subjects included for the Prelims, Mains. The conducting organization had announced the exact date for the Prelims Exam i.e, 25th April 2019. And the date for the Mains Exam is yet to be in the month of May 2019. At the end of this page, you can also find the direct link to download the ఆంధ్ర ప్రదేశ్ పబ్లిక్ సర్వీస్ కమీషన్ Extension Officer Syllabus 2019 in PDF format for free of cost. Candidates who have recently applied for the APPSC Extension Officer Grade I Recruitment 2019 must note down the prescribed psc.ap.gov.in EO Grade – I Selection Process 2019. So, by the given procedure you need to prepare. They have officially announced that only those who qualify the written test will only have the further process. All the applied and eligible candidates must check this division to note down the ఆంధ్ర ప్రదేశ్ పబ్లిక్ సర్వీస్ కమీషన్ Exam Pattern 2019. Furthermore, below are the accurate AP PSC EO Test Pattern for the Prelims test as well as the Mains Examination. By looking at the below tables, you will get an idea over the structure of the test paper, the time duration and also the marks allowed for each paper. So, do note these instructions before starting preparation for the examination. Furthermore, you need to complete your revision before the exam date so that you may have the time to revise again. There is 1/3 rd negative marking for the examination. From this article, candidates can download the APPSC Extension Officer Syllabus 2019 PDF. And also for the students who want to know the syllabus can straightforwardly download the APPSC Extension Officer Exam Syllabus. As we have provided the topics important for the Written Examination you can take the PDF available here. Most of the students don’t know the topics to cover before the examination. So, for the ease of the candidates, we here gave the APPSC Extension Officer Syllabus 2019 for their ease. Therefore, they can easily download the papers of AP PSC Extension Officer Exam Syllabus 2019 PDF. Through this PDF they can know the topics to cover and also the mandatory subjects too. So, look at the below link to download the appropriate topics from the PDF. Hope all the candidates will definitely download the APPSC Extension Officer Syllabus 2019 PDF to start preparation. For any other information, you can easily come and check our page @ Freshers Now so that you can return with only genuine stuff. So, bookmark us by Ctrl + D for the more updates. Also, our page will provide you with the alert, push notifications.